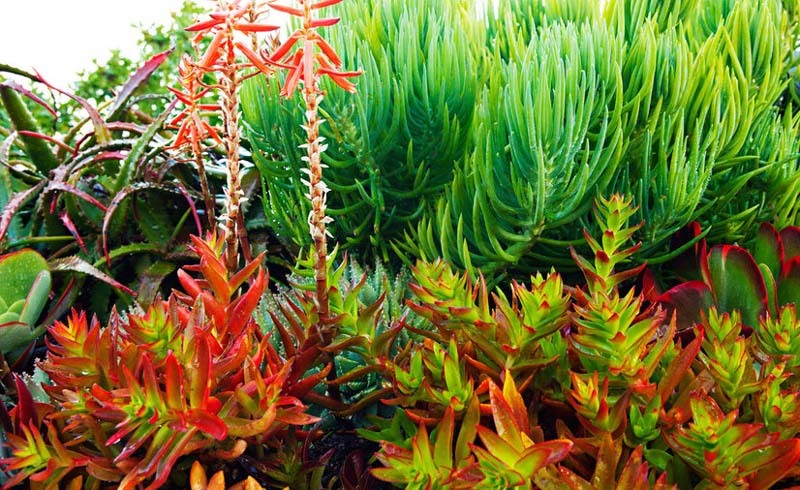 Succulents are terra firma’s answer to sea creatures, as jewel-toned as shells, sculptural as seastars, or fluttery as sea anemones. 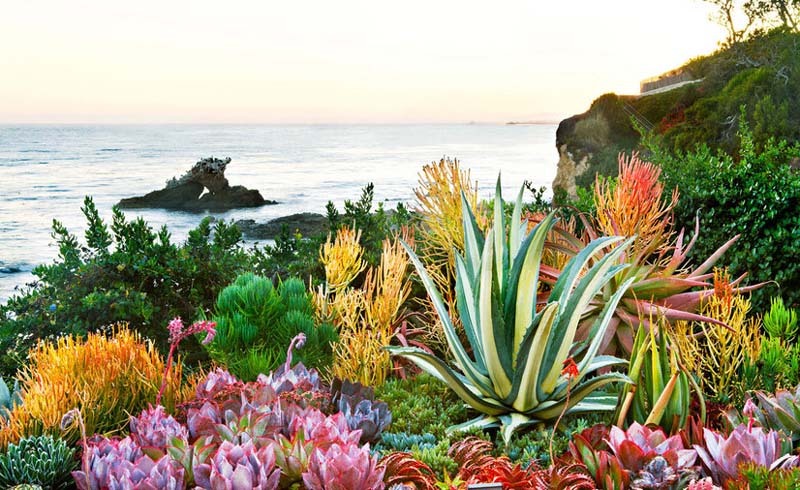 This garden, in Orange County’s Corona del Mar, shows off succulents’ wilder, more colorful side. The plantings create a spot-on connection between land and sea, as though they simply arose from the waves complete, like Venus on the half-shell, to their perch atop the bluff. 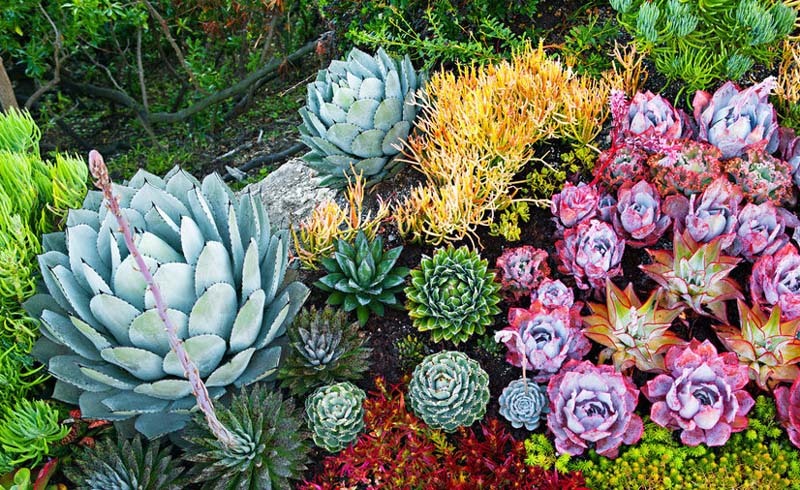 In beds around Anton and Jennifer’s patio, Joe planted purple echeverias, orange ‘Sticks on Fire’, and cool blue aloes. All of them thrive on little water and stay low enough to frame the Segerstroms’ coastal view without blocking it. Spikes of deep orange flowers emerge like crab’s claws from this echeveria’s large (12- to 16-inch), loose rosette in summer. Leaves are powdery and normally pinkish lavender with brighter pink edges. But when stressed by sun and sea air, they turn the vibrant hue pictured. Plant it in sun or light shade. 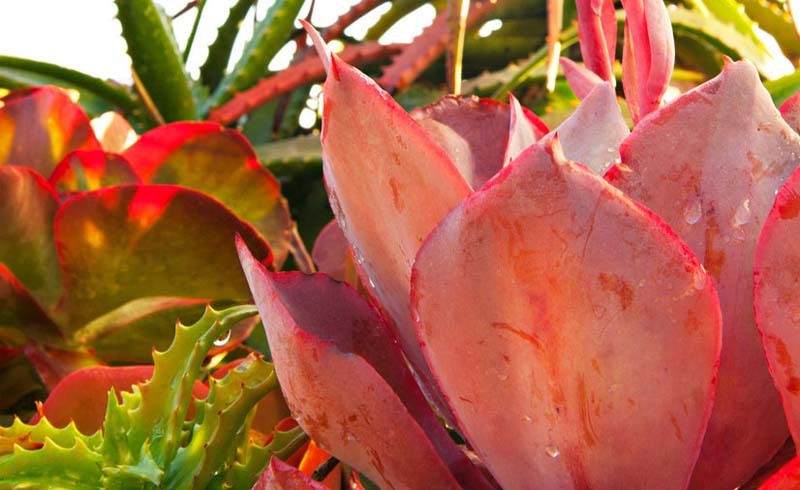 Leaves with red edges and a nearly iridescent sheen make this succulent appear to glow like a seastar in a sunlit tidepool. Echeverias tend to stretch with too little light, so give this large (18-inch-wide) echeveria sun or bright shade. Here, a colony of ghost plants (Graptopetalum paraguayense) surrounds it. Flanked by smaller agaves, A. parryi truncata appears to wait for prey to glide past. 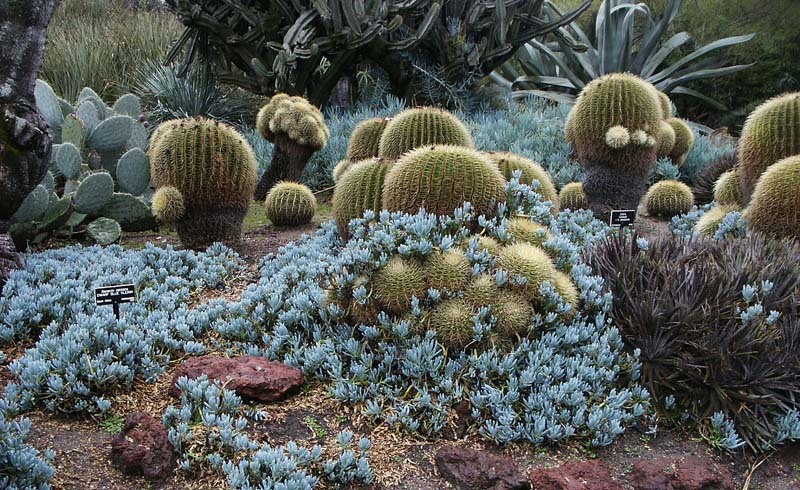 This powerhouse succulent (as large as 2 to 3 feet tall and 3 to 4 feet wide) and its smaller brethren are tough enough for desert gardens; plant them in full sun in all but the hottest climates. ‘Bloodspot’ mangaves drift in the agaves’ wake, adding their own edgy interest and dappled patterns to the sea-bed scene. As though swaying in ocean eddies, this yellow-green Senecio has semi-prostrate stems and narrow, upward-reaching leaves. Its shrubby (to 2 feet tall) nature makes it an excellent backdrop for a dry garden. In front are Kalanchoe luciae ‘Fantastic’ and spiky Crassula capitella thyrsiflora ‘Campfire’, a chameleon that’s green in part sun, vermilion in full. Add a showstopper. 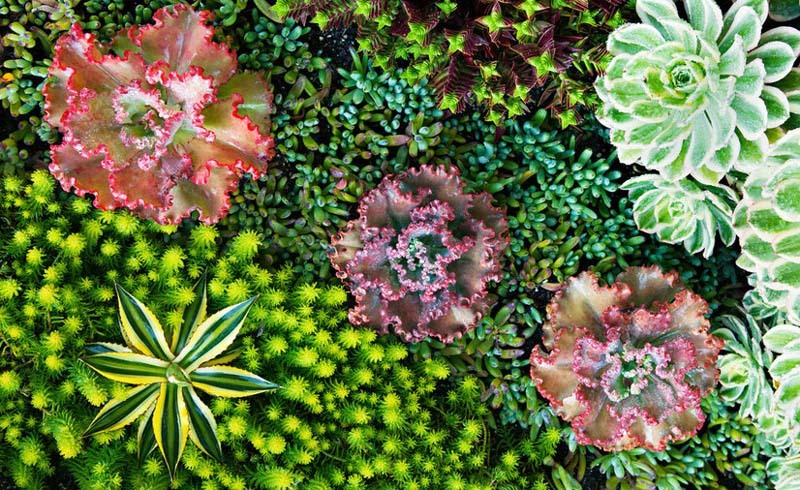 Every garden needs a striking plant, one that’s bigger or more colorful than the rest. Despite its petite size, the star-shaped Agave lophantha ‘Quadricolor’ (at top right) draws attention with its green stripes. Mix lacy with bold. 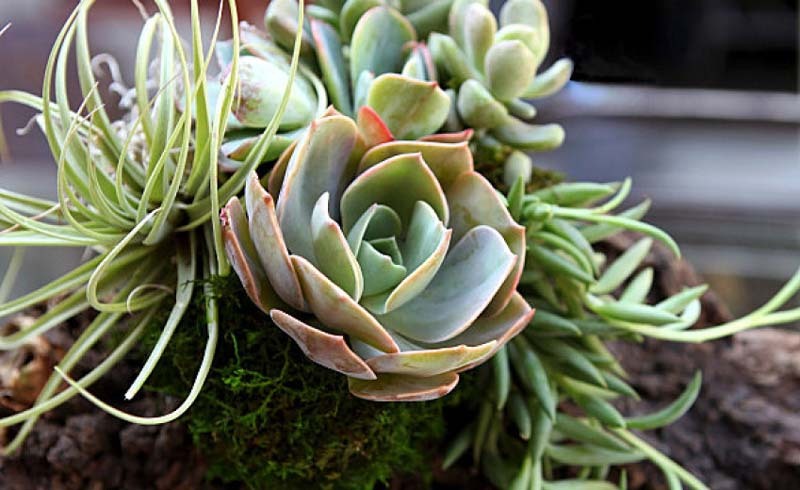 Keep your planting lively and interesting by clustering more textured, delicate succulents—like the trio of ruffle-edged echeveria hybrids pictured—around bolder, more muscular ones. 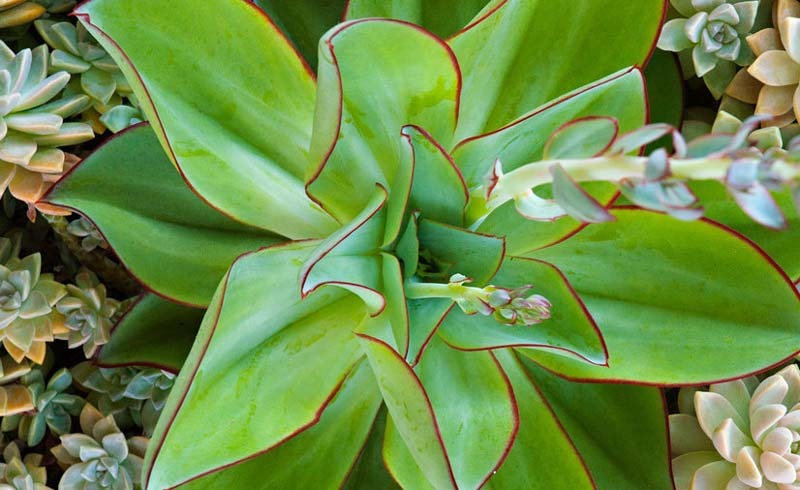 ‘Sticks on Fire’ has the same effect behind a whopper agave. Fill in with tiny mats. The little guys make the big ones stand out. Thanks to bands of starlike Crassula corymbulosa ‘Shark’s Tooth’, knobby blue Senecio serpens, and lime green Sedum rupestre ‘Angelina’, the three echeverias and the Aeonium ‘Sunburst’ (at far left) really pop.